Grab The Promo Codes & Coupons Then Review These Amazon Deals Join now to grab a deal. There are no Amazon deals in this marketplace -- Yet. Grab this Amazon Deal then Review it to help out our Seller. 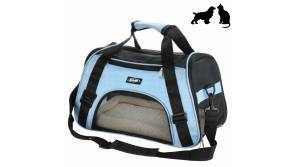 Size:Large Carrier In fact, Dogs love car rides, and they would love to join you in your trip. Whether it's a month-long cross-country trip or a weekend getaway with the family, your furry friend can travel in style with this pet carrier.You will have a nice time with your love pets. Specification: -Size: 20.8"" L x 10.2"" W x 14.1"" H -Material: Oxford cloth + mesh + Plywood plate, the bottom is hard Plywood -Strap length: about 30""-47"" (adjustable) -Recommend Pets Weight: up to 22 lbs Designs and Functions: 1.It is made of durable oxford fabric and mesh which can effectively prevent tear from claws,for small animals, it is very important to trim their nails regularly and maintain a proper body. 2.The floor is firm under the fleece travel bed, so it is for secure transport,even the heaviest cat or dog. 3.The extra-thick, soft fur bed not only protects your pet, but also has a sturdy design that ensures they are more comfortable. 4.Mesh ventilation on sides and top not only provide adequate airflow, but also easy viewing--perfect for your pet to look out and for you to check on your pet. 5.Two entrances, easy to access,zppered on side to calm your pet easily. 6.Safety buckle zippers,pet can be safe in the pet carrier. Note: 1.Please measure your pet before purchasing (LENGTH: neck to base of tail; HEIGHT: floor to top of shoulder). 2.Please DO NOT choose your pet carrier based on weight(recommended for cats and small dogs up to 22lbs). 3.Pets should not be left unattended in this carrier. 4.When traveling in a car, be sure to secure the carrier to the seat of car by seat belt only. 5.Please contact with airline before flying with your pet to avoid needless trouble and affect your trip. 6.NO rodents NO rabbits：if you need a carrier for a hamster or a rabbit,you should choose an iran one,this carrier could not be the right one for you. Our carrier is great for cats and small dogs.